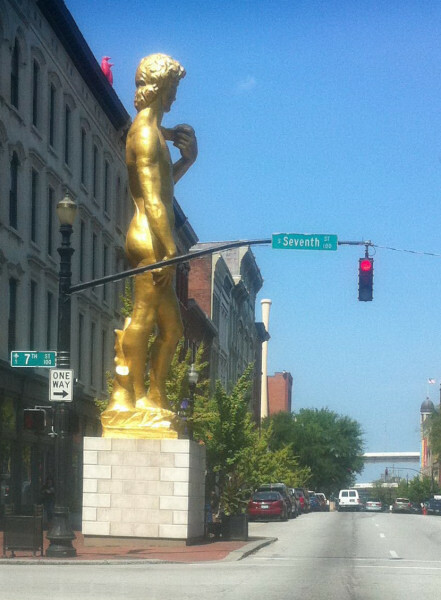 What David is doing all covered in gold and standing larger than life (30 feet tall) by the ONE WAY sign on the corner of 7th & Main streets in downtown Louisville, we may never know. He stands in front of the 21c Museum Hotel. This statue was designed by an artist who had never seen Michelangelo’s original. 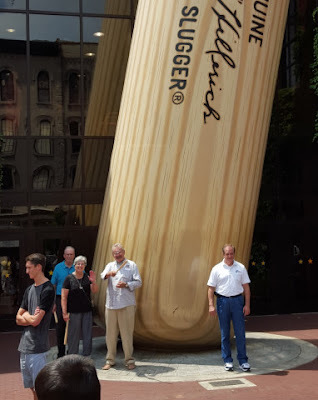 Roadside America.com brags: This “sets the standard for the biggest male package on public view in the U. S.” Anyway, if you look down Main Street as David seems to be doing, you can spot the largest baseball bat you’ve ever seen. Maybe David’s dimensions were made big enough for him to get a hold of that bat. 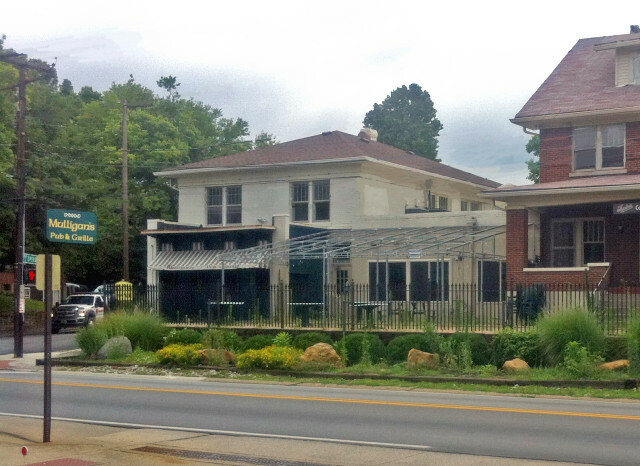 The bat is one block down Main Street from David. It stands at the entrance to the Louisville Slugger Factory and Museum. As we toured the place, I wished I knew more about baseball than I do. The Louisville slugger bat was used by all the greats from Babe Ruth to Mickey Mantle (didn’t he marry Marilyn Monroe for a short time? ), and is still considered one of the best bats available. Favorite wood is Ash, and the factory can bore out seven or eight bats from an Ash log, and burn your signature into the wood. The museum has thus acquired the signatures of all the great baseball legends. I can be seen at the base of the big bat wielding the miniature bat given to those who take the factory tour. The other touristy thing to do while in Louisville is visit Churchill Downs, the Kentucky Derby racetrack. We were admitted into the stables by Katie, a young girl who exercises the horses. The first thing we noticed as we entered these hallowed grounds that host the first of the triple crown races that end the racing season each year, was a huge television screen that has been erected. Jerry Jones, eat your heart out! Fans privileged to get into the infield, have been unable to see the horses until now. 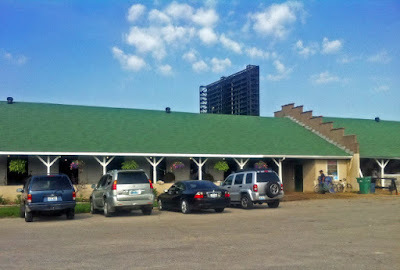 I was amazed at how many stables there are at the Kentucky Derby. Some like this one I took a picture of below the towering black screen, was better kept than many with flowers hanging in front of each stable. Katie exercised two horses the day we visited. Our nuns wanted me to give them conferences on Saint Teresa each morning of the novena, but we skipped this morning so I could tour the racetrack. Katie introduced us to all the horses in the stable she worked in. Some were meek and mild; others she warned us were mean, so we kept our distance from them. The week I flew home to our Monastery in Little Rock one of those wild horses threw Katie. 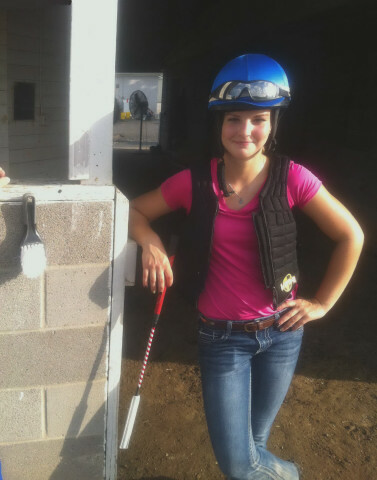 She fell and fractured one vertebrae in her neck and suffered two broken ribs. I asked her what she’d have to do to become a jockey, and she said, “lose some weight!" So this brings me to the main reason I was in Kentucky for the feast of Our Lady of Mt Carmel. 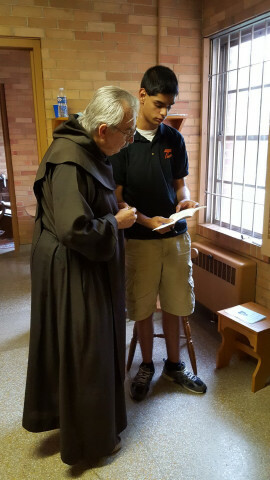 In mid-summer, most of our monasteries receive invitations from various churches, monasteries and convents throughout the country to preach for their nine day novena preceding the feast day of July 16th. My invitation came from our Louisville Nuns. As the nuns are preparing to move from their monastery, they put me up at the Passionists next door to them. Right across the road from the Passionists’ school is what used to be Mulligan’s Pub. I passed it each day on my way to and from the nuns’ convent. It was originally Kaelin’s. Mulligan marked a cultural change from German to Irish, but back in the day when it was Kaelin’s it is said that the Cheeseburger was invented here. 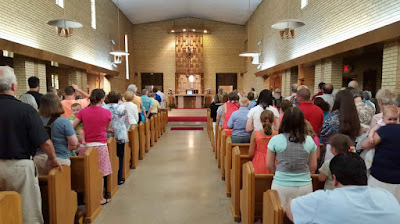 Here’s a picture of our Nun’s chapel packed for the feast of Our Lady of My Carmel. The great feast was tinged with sadness knowing this would be the last time the nuns would have a big celebration in their monastery before moving out this summer. Before Mass I witnessed a young man make his consecration to Our Lady in the monastery’s sacristy. Back home in Little Rock, Father Paul Koenig OCD from our province in California preached the Mt Carmel novena in Little Rock. He is shown here next to Bishop Anthony Taylor on the final day of the novena. 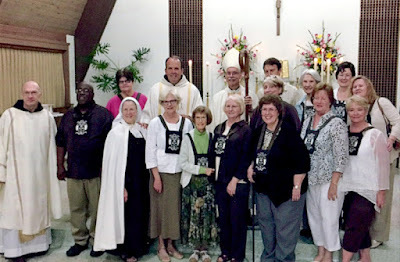 Father Jerome (far left) concelebrated. 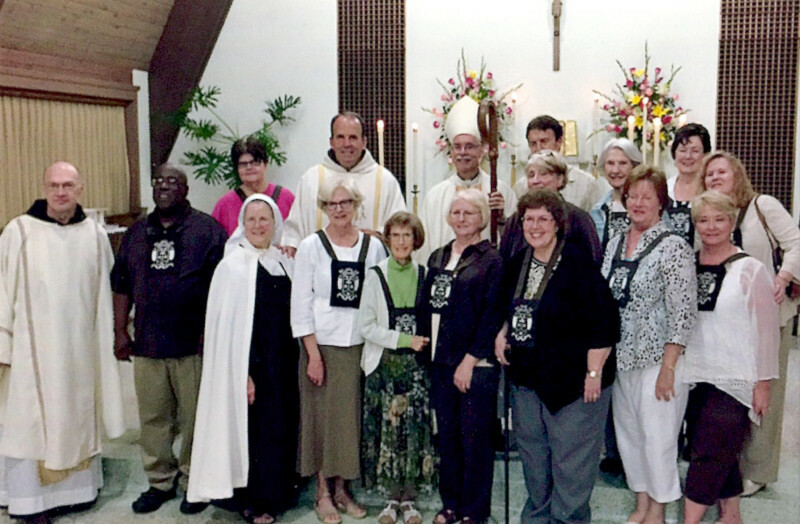 The celebrants are surrounded by our Secular Order members including Tony Thompson & Amy Hawley (next to extern Sister Magdalene of the Son of Man), Paula Martin, Barbara Ford, Susannah Nelson, Mary Armstrong, Jennifer Perkins, Jeannine Hart & Mary Howard.